The Tardis, located outside the front door of The Rosemary House is a central attraction on busy little Market Street! Although we frequently get asked if it really is a police box, in reality it is a Little Free Library where you may take a book or two and drop off a book or two. An Eagle Scout project completed by a local boy scout, we shared about the Tardis in this blog post earlier in the year. The books are organized by age group, and that's a job in itself as the transition of books coming and going is almost constant. You'll find early readers, teen novels, mysteries and books for the adult reader. When we had our Fairy Festival earlier this month, Susanna was sure to tuck in a few fairy books for some lucky young people to discover. With the upcoming PA Tea Festival this week (Friday, Sept. 29th and Saturday, the 30th), she has a few gently used tea themed books to place in the Tardis for some lucky tea enthusiast/festival attendees to discover. If you have any tea books you want to contribute to the Tardis, we encourage you to do so! Take a book, leave a book. It's the cycle of the Little Free Library. And, if you snap a picture or two of yourself with the Tardis, do share them on our Rosemary House Facebook page, #TRHTardis. A very special thank you to the PA Tea Festival Sponsors. Their support, input, and contributions have helped to guarantee a successful event. Tea Time magazine editor Lorna Reeves will be in attendance. Lorna will be presenting two programs in the lecture hall, Tea Party Planning Made Easy, Friday at 2:30, and Saturday at 11:30, Afternoon Tea Made Easy. Nepal Tea, Nous Tea, and Tea-for-All represent a varied range of tea vendors. Nepal Tea brings tea direct from the Nepalese farmer and speaks from a personal experience. Nous Tea sources tea from under appreciated areas from around the world. Tea-for-All source a variety of teas and encourage you to expand and educate your palate. The Mid-Atlantic Tea Business Association is made up of regional tea entrepreneurs, many will be represented at the festival. While The Essential Herbal magazine features the world of herbs and herbal entrepreneurs. 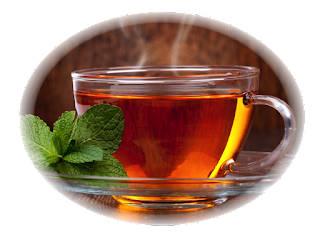 An Early Elegance provides teas from distant lands and has offered a gift basket. Visit Cumberland Valley has helped promote the festival through many avenues, and Garden Talk with Bob Carey has been our radio voice. We certainly appreciate this amazing group of sponsors. In addition, our 2017 Festival Partner is Roaring Spring Water. This local, fifth generation family owned business uses a filtration and purification process which ensures that their water is of the best taste. Since water is the basis for good tasting tea, you want to start with quality tea and pure water, either fresh filtered or bottled water. Thank you to Roaring Spring Water for partnering with the PA Tea Festival! The PA Tea Festival is scheduled for Friday, September 29th and Saturday, September 30th from 9 am to 4 pm. The admission for this event is $15.00 per day. Tickets are available for purchase prior to the festival at a discounted rate ($12.00) and can be purchased via EventBrite or at The Rosemary House. Held rain or shine, in the gardens behind the shop, and in the back alley, there will be over 20 vendors selling a wide variety of tea, tea wares, and accoutrements. Informative lectures are scheduled each day, and guided small group tea tastings are also planned. The schedule of events lists all of the activities that are organized for each day. The lectures are included in with your admission fee, however seating is limited and on a first come basis. The small group tea tastings (limited to 16) will require an additional ticket to attend those sessions. It is suggested you purchase those tickets in advance as a few of the sessions are sold out. Every festival attendee will receive a tasting cup to use throughout the day. There will be many different teas to sample at the various vendor booths. In the center of our table at the Grand America Hotel in Salt Lake City was a wine goblet that held an artisan tea - a blooming tea. When the hostess poured hot water on the tightly rolled ball in the goblet, it slowly began to unfurl, and it caught Cedar's attention. Finally - something tea related that was worthy of the attention of a 14 year old! Blooming teas, or flowering teas are meticulously hand crafted using dried tea leaves and flowers. They are crafted into a tight little ball, stitched together in just the perfect way, that once water is added, they slowly open and create a beautiful display flower. Obviously, these flowering teas are best enjoyed with a clear glass tea pot or goblet. Not only is it a floral display, or centerpiece in this case, but it is a delicate green tea that can be sipped and enjoyed. Typically created by the artisans of Yunnan, China, flowers that are commonly found in blooming teas include globe amaranth, chrysanthemum, jasmine, lily, and hibiscus. Another example of a blooming tea (one that we sampled while visiting a tea shop in NY) can be seen in this blog post. Our vacation travels this summer took us to Salt Lake City, Utah. And luckily, the Grand America Hotel serves Afternoon Tea. This very special experience in this very elegant hotel was a memorable occasion. Served in the Lobby Lounge, the table was set, complete with a compote of Strawberries and Creme Chantilly. A comprehensive list of tea choices was available. One of us selected the Brahmin tea, a full leaf black tea, sophisticated and delicious any time of day. Much to Cedar's delight, he was able to get a pot of hot chocolate and a tea cup full of whipped cream He was one happy camper at this tea event. The three tiered tray included a beautiful assortment of savories and tea sandwiches on the bottom tier. The middle tier held English scones and the top tier featured the jam, cream, and curd for the scones. The sandwiches were are very special and unique. Several were on home made crusty rolls and petite breads. The absolute favorite was the savory salt and pepper macaron with a goat cheese filling. A vegetarian option is available upon request, and it featured a nice assortment of sandwiches. The little upright glasses held roasted veggies and marinated veggies. The staff was happy to provide additional sandwiches if you wanted a few more, and yes, we each requested the salt and pepper macaron! The scones were hearty, warm, and served with cream, jelly, and curd. The beautiful dessert tray held an exquisite variety of desserts. The top tier included sweet pistachio macarons topped with a raspberry gelee. There was a yummy chocolate mousse topped with fresh berry and cream and a smaller gelee garnished the plate. French Madellaines were on the middle tier along with buttery jam filled cookies. Petite tartlets and miniature shortbread tarts were placed on the bottom tier. The French trained pastry chef had fun putting this together! What an enjoyable Afternoon Tea with an abundance of tasty morsels! If we lived in Salt Lake City, this would be a frequent destination! Time marches on much too quickly! The magic of the 24th Annual Fairy Festival is but a memory in the hearts of those that attended. 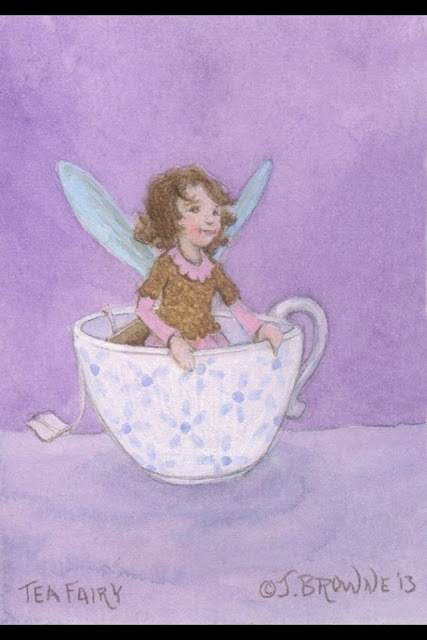 The Pocket Fairies held glittery tea parties in the gazebo throughout the day, sharing trinkets and telling stories of wonder to delight all. Our favorite bubble maker, George, kept the bubbles flowing all day capturing the imagination of the littlest fairies in attendance. The artistic face painting created by Kit Kat Sparkles and Posie Fairy could be found among the many festival visitors. Henna designs crafted by Zehen were an option for the older kids. There were puppet shows presented by Big Shoe Puppets that delighted young and old. And balloon creations were offered by Top Nozzle, the Next Generation. And the green recycle troll helped to educate about the importance of recycling. 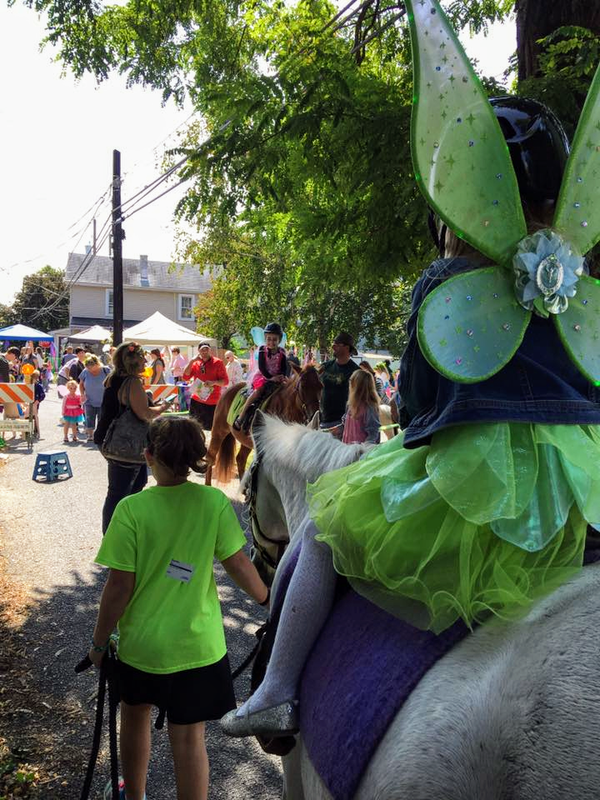 Pony Rides by Hidden Stables on Sunday while Princess Carriage Rides were available on Saturday. Don't you just love this photo of a beautiful fairy riding upon her stealthy stead, Chief? while the Pixie Puppet Tree theater performed under the Pavilion. Nancy served a variety of kid friendly food, fairy sweet treats, and oven fresh scones including chocolate chip! And none of this would have happened without the vision and dedication of Susanna, youngest daughter of the King and Queen of the May. She pulls it together, organizes, dreams, creates, decorates, and believes. Kudos for a job well done! Here's to 2018 and the 25th Annual! 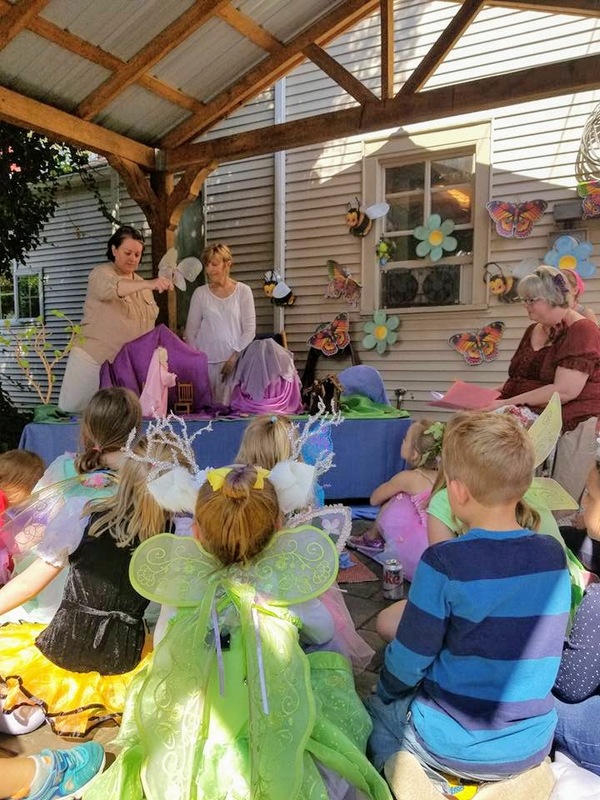 Our 24th Annual Fairy Festival is scheduled for Saturday, September 9th and Sunday, September 10th from 10 am - 4 pm in Rosemary Alley and the herb gardens of The Rosemary House and Sweet Remembrances. This special event is perfect for children ages 3 - 11, and for all who believe. Come experience the magic! Price of Admission is only $5.00/person. 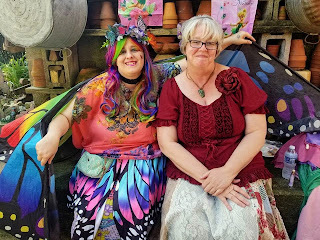 For updated information, visit our Fairy Festival website. Our 1st Annual Tea Festival is scheduled for Friday, September 29th and Saturday, September 30th, from 9 am - 4 pm in Rosemary Alley and the herb gardens of The Rosemary House and Sweet Remembrances. This two day premiere specialty tea event will feature a variety of merchants and vendors, a range of teas and herbal tisanes, tea tastings, tea culture, and informative programs. Price of Admission is $12.00 in advance, or $15.00 day of event. Tickets may be purchased at The Rosemary House or via EventBrite. Detailed information is available on our PA Tea Festival website. In 2005 a series of sculptures entitled Flying Objects were erected along 300 South in Salt Lake City, UT. Since they were originally erected, various additional sculptures have been added over the years. This whimsical public art series includes a variety of different themes, but when a friend shared a photo of this fun sculpture, we made it one of our destinations while driving around Salt Lake City. For more information about this series, visit this website for additional photos of sculptures in the series in a city described as having a vibrant art scene. During our adventure out west, we spent a few days in Salt Lake City. While there, we had the opportunity to visit the Tea Grotto. Established in 2004, this fun business offers loose leaf tea, tea infused foods, an opportunity to enjoy tea in a calm and peaceful atmosphere, and an overall enlightened vibe (as per their website). Located at #401 East 900 South (thank goodness for Google Maps), we made a quick visit here and found the shop and the clerk very welcoming. While we were there, there was a steady parade of customers. Some purchasing loose leaf tea to replenish their stock, others picking up a 'to go' cup of their favorite tea, and others sitting down to enjoy a cup of serenity. Our order included a little bit of everything. First, we sampled an oolong prepared Gongfu style. This little tray held everything we needed to measure, brew, steep, strain and enjoy multiple steeps of the oolong. Susanna tried one of their flavored Chai blends which was served in an oversize mug. Angelica has become a matcha enthusiast and she ordered iced matcha. While there, we had to try some of the tea infused food. We ordered the hummus plate which came with a nice variety of veggies. The tea flavor with the hummus was mild, but inspiration to try making this at home! So what did Cedar try? Well, right beside the Tea Grotto was a little sidewalk cafe where he was eager to purchase a soda. He nibbled on a few of the carrots also. There are a lot of little nooks to sit. Cushioned sofa, a semi-circular table overlooking the sidewalk to people watch, square tables and chairs in the center, and even a hidden private little area to escape the din of the world if you wish. What a great spot where (to quote their business card) Tea Lovers Unite!